Who doesn't love Thai food? In Kingston, there are numerous Thai restaurants. Our favourite is Pat's. They don't have a website for you to visit, this Urbanspoon post is the closest. But this isn't a story about Pat's Restaurant (although you should go if you haven't already). This is a story about Soup A. Before we tried Soup A, we were all about number 1 and number 6. Then, one day we were daring. We ordered Soup A. And were officially smitten. It warmed us up in a way numbers one and six didn't. And the serving is HUGE (we share it). We've tried other restaurants version of Soup A....but sadly they didn't compare. Pat's has a certain.....hmmm....it's creamier and richer than others. We set out on a mission to try to re-create it at home. So, here is how our Soup A (also know as Tom Yum Goon) turned out. Most followed us home on our last trip to Toronto, where there is a great Asian supermarket we love to visit. We fill our cart with exotic fruit and veggies, well priced fish and the best price on coconut milk ever. I poured the stock into my pot. I then added a handful of shrimp shells from my freezer (I've been saving for well over a year, for a shrimp bisque recipe in a cook book I have. It will be epic when I have about 4lbs of shrimp shells. They are very light, so I suspect this will take me another year, unless we drastically increase our shrimp consumption) If you have unpeeled shrimp, don't bother with shells. Then I cut about 2" off my lemongrass stalk, crushed it a bit and threw that into the pot. Then I added some slices of ginger and garlic, and let the whole thing simmer away for about 30 minutes. 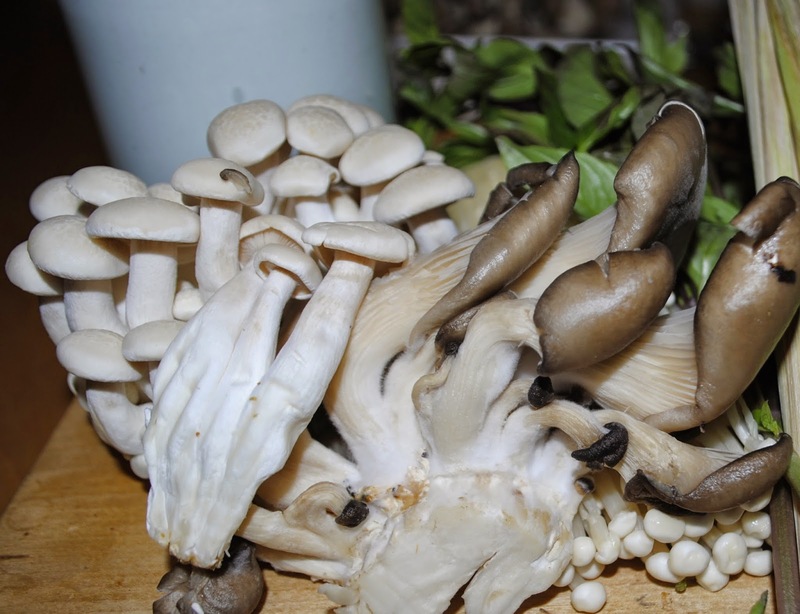 The darker coloured ones are oyster mushrooms. The little guys hiding under them are enoki, I'm not sure what the others are. Curry paste, basil leaves and shrimp followed the mushrooms into the pot. Serve our Soup A over a mound of hot cooked rice, sprinkle some lime juice and garnish with cilantro. You'll soon see why the word "Yum" is in the name of the soup! And Shawn found it "spoon worthy" Spoon worthy you ask? Well, that is a whole other story! I will share it soon! While very YUM, and deemed spoon worthy, I'd love to spend an afternoon in Pat's kitchen learning his secrets. For now, this is a fine substitute. Until then, when we need our real fix, it's to Pat's we will go. You know you're desperate for cookies when you turn the oven on at the end of July to bake. But have you met July 2014? Not so many hot days. So baking cookies today, not a big deal. It's our first day off as a family this summer. Shawn and Fintan have been busily re-vamping the barn for our hen and turkeys. The turkeys have outgrown their wee corner, and needed to move into the bigger room. Iain & I, well, we did our part, then went for a bike ride and upon our return, decided cookies were in order. We had purchased white chocolate chips last week dreaming of reverse chocolate chip cookies. But when I jumped on line, I couldn't find ANY recipes using spelt flour (remember, Shawn has been wheat free for well over a year now) So, I made up my own cookie recipe. Yep, I did. The last time I "invented" my own baking recipe, was the fruit juice cake when I was about 12. I don't think it was any good. Beat the butter and sugar until fluffy. (hint: we don't own a microwave. It blew up a couple of years ago, and we never bothered to replace it. We heat up coffee on the stovetop. If you're like me, and don't plan ahead to make your butter room temp, I run hot water on the outside of my stainless steel mixer bowl with the butter in it. It seems to soften it enough to work) Add the eggs and syrup. Beat until all fluffy. In a separate bowl, mix flour, cocoa and baking soda. Add to wet mixture while still beating. Fold in chips. The mix is fairly wet, this made slightly cake-y cookies. If you prefer a crisper cookie, try adding another 1/4 cup flour. I was out, so settled for cake-y cookies. Still yummy. Drop by spoonful onto cookie sheet. 9 minutes at 350c in convection oven baked perfectly. Adjust to your oven. Enjoy with cold glass of milk, about 7 minutes out of oven!! I think that's a thumbs up! I spent much of my training this year focusing on my riding (I even knit myself a new bike!) as I felt that that's where I was weakest. 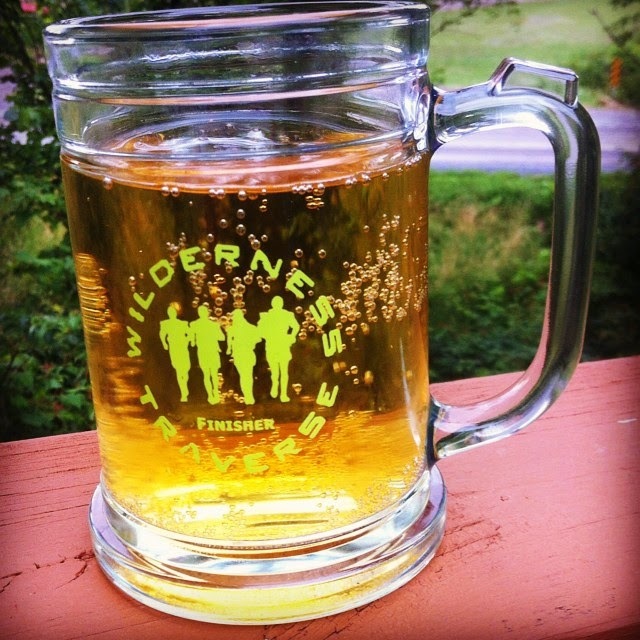 I hoped that would pay off and make us faster as a team on the trails. We arrived at HQ Friday in good time, unloaded our gear, sorted through our gear, and got front row seating for the course reveal. Here's a video of Bob, the race director revealing the course if you are interested. Or a peek at maps if you want to follow along! The course starts off as a paddle, we all get into our canoes and line up at the start line, just in time for some early morning fisherman to yell "Start" at us....many teams did, until Bob told us to NOT start. Seconds later, he gave us the go ahead. View of the Islands from above....tricky navigating! Our plan was to follow the main land shore to the north tip of Meneilly Island and then cut down to the island where CP1 was. Not the shortest route, but the safest. 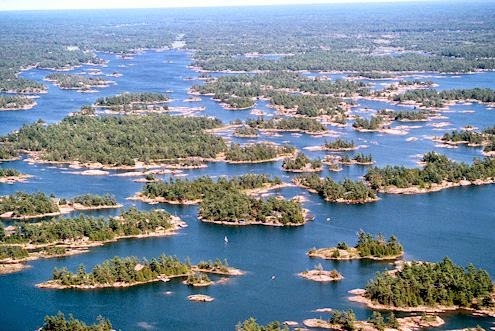 This area is called the Thirty Thousand Islands after all, and navigating through them wasn't going to be super easy, especially since we wanted to move fast! It was very apparent early that most teams were opting for the shorter, but more challenging for navigation course, through the islands. At one point we thought we could follow the pack and rely on their nav, but this was our race, and we wanted to run it ourselves. Yes, it put us near the back of the pack, but we figured it's early yet, we'll still have a chance to make up some time. 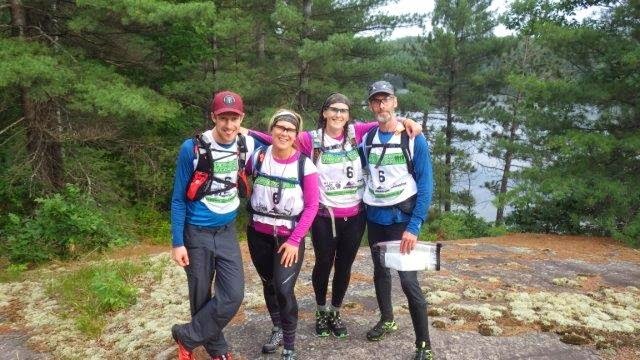 We got the CP, and continued on our way into the Naiscoot River Channel towards CP2. It was a bit tricky when we reached the middle channel, we saw a group ahead attempting a portage that we had thought to try, but as we got closer, well they were returning...not the right place. So instead, we scooted around the corner, paddled (poled?) our way through some thick lily pads, then pushed our way through some bushes into the river. The paddle along the river was relatively quick, but boring after awhile, we kept hoping to see something new around the next bend. Finally, sometime after CP2 signs of cottages appeared and we hit the "portage" over the dam. There were a few other teams there pushing through and resting, resulting in a line up that cost us some time. Finally we're on Six Mile Lake, into Little Wilson, then Wilson and then we are done! 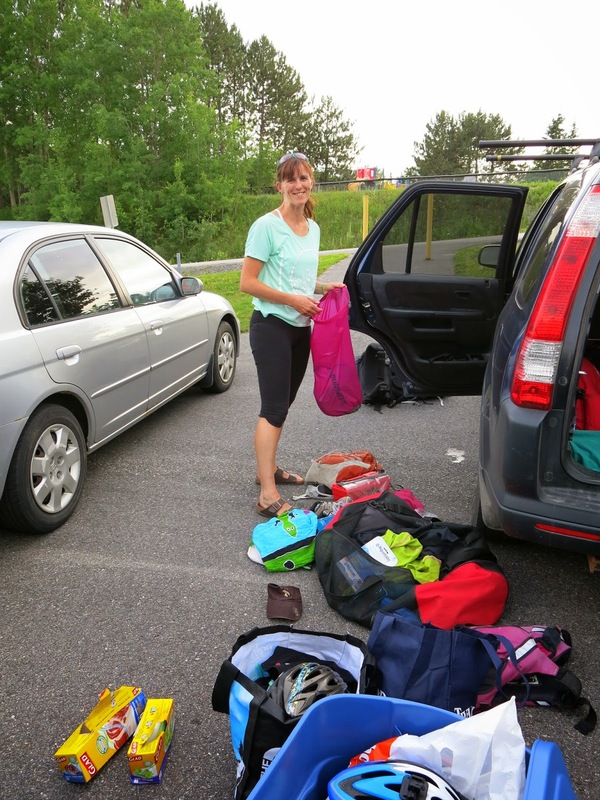 A quick 1km portage to our gear bins and transition to trek. We moved through transition fairly quickly, a quick shoe change, food in mouth, food and water into packs, and a heavy dose of bug dope, man the mosquitoes were bad there! (they only got worse) Trotted down the trail until we hit the creek we intended on following towards Spectacle Lake. Had a fun group crossing at a set of rapids (some old river rescue courses coming into play here) followed the north shore of Spectacle and set our bearing to bushwhack our way to CP4. We felt pretty good moving through the bush here, knew where we were, and moving at a decent pace. Then another team caught up to us. When asked what bearing they were following, they responded "yours!" Ok, so we have followers. Not to be rude or anything, but we weren't really looking for company. We came out on the shore of Trout Lake, found another team who asked if we knew where we were, we answered yes, they asked where and we said at CP4, it's right over there. We arrived at CP4 just as the crew there were cooking up some freshly caught fish. We didn't stick around though, as yet another team was arriving, and well we weren't here for a party. We had a quick team picture snapped (I know one of the volunteers there, he emailed me the picture) and were off. Off to make an error that would later cost us. Our intent was to bushwhack to the power line from CP4, rather than follow the shore to the trail. We moved along the shore to where we were going to start our bushwhack, but a bunch of other teams caught up to us, and we stepped aside to let them pass, and double check our map. I guess we got all caught up in the traffic, and second guessed our intent and thought, well maybe we should play it safe too. So we continued on past where we were going to turn off, found the trail (or so we thought) but it was wrong. We figured that out rather quickly when the trail veered off in the opposite direction we wanted. So we trudged back to the lake, set a new bearing and set off for a bushwhack, our original plan. Which was not the best plan. We spent the next 3-4(?) hours bushwhacking our way slightly northeast hoping to catch the trail before the hydro line. Finally, through the treeline I spotted what I thought was the tip of a hydro pole. Candice and Gerhard confirmed my sighting, good not a hallucination. We went for it, and then hit the first bog. OK, we can cross this, it's all Labrador Tea and mossy bogginess. Kind of like walking on water bed. I had visions of going through, and not re-surfacing. That just made me move quicker. Ok, through the first one. To have another stretch in front of us. OK, let's do that 3 more times. And then a really deep, mucky 5' "water" crossing. To deep to walk, to short a distance to swim. I'm not sure what you'd call what we did, but somehow got across it. 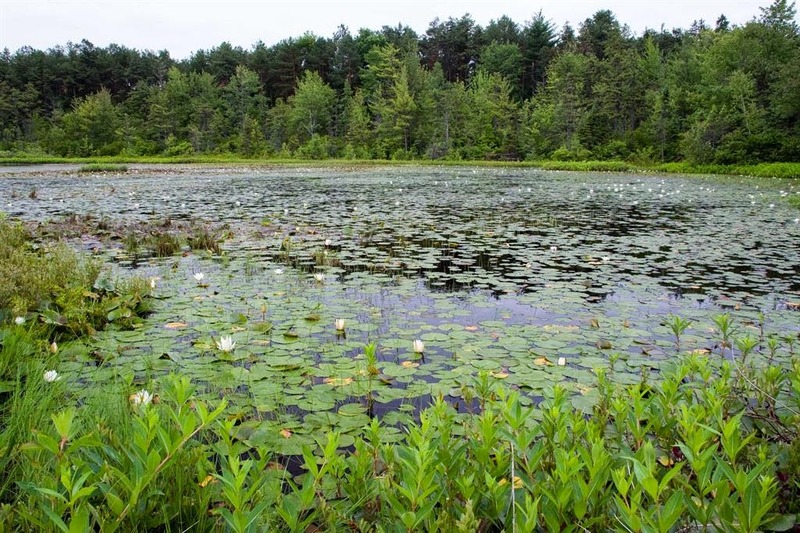 Only to find a swim across the swamp that was at least 50' across. So we swam. Gross. And then stumbled onto the trail. Oh, so happy. It was still light out. And we now knew where we were. We got onto the hydro line, had a quick re-fuel, pulled out our lights as we'd need them soon, and continued on our way over to Dogfish Lake. We encountered a team biking towards us.....well that was rather discouraging. But we were given some friendly advice from the team to take the north shore (that was our plan) and that the bushwhack we intended from CP5 to CP6 took them 2 hours in daylight....the road would also take 2 hours. We tucked that information away, wished them well and watched them speed off. Once we found the creek/river that led to Dogfish, and we crossed our second set of rapids we started the steep rocky trek along the shore. It is now full on dark. We are treated to a short view of the night's super moon. Gorgeous and red. But no time to stop and admire, and then it disappears behind some clouds. We spot a fire on the far shore, and some encouraging words are yelled across to us "You're going the right way!" After we lose the fire, I think I start hearing thunder in the distance. Then I hear it closer....no wait, that sounds like a generator! We have reached the cottage about halfway down the lake. We are greeted by a bunch of kids yelling "What's your name?" "Are you coyotes" A tattooed, beer drinking man hanging out by some muddy ATV's greets us. "Turn off your lights, save you batteries...come here use my light" He then tries to convince us to not continue the shore, take his road. We explain that that will take us way out of our way. Again he tried to discourage us from going on. "The shore is bad, it's worse than what you just trekked, I have extra bunks, come on in and sleep" We thank him, but explain that we are going to keep going, but promise if we run into trouble, we'll come back. He then asks us if we have protection. "What do you mean" I ask. "Guns" was his reply. Ummm, no. As we set off, we here his buddy tell him he could have been more encouraging. So he yells out "Good Luck" to us. Nice guy. dark and the middle of nowhere! We find the ATV trail and start heading towards CP5. We are a bit confused when we see a team (the same team of guys who "followed" us before heading towards us, "You're almost there" they encourage us. Hmmm, where are they going? We get into CP5 a bit dejected, convinced we are dead last, clearly the teams we tried so hard to "ditch" moved faster from the last checkpoint than us. But no, the crew at CP5 let us know there are still teams behind us. OK, that picks our spirits up a bit. It starts to rain, and the crew also tells us that many teams have opted to take the road to CP6/TA2. Not our original plan, but we figure we can give it some thought as we move onward. It starts to rain a bit more earnestly. We are now moving along a slick, muddy wet trail in the rain. So we totally were not prepared for what happened next. Candice and Grant were just ahead of my and Gerhrad, when she suddenly grabs Grant's arm and pulls him to a stop. 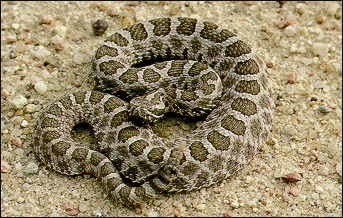 A Massassauga Rattle snake is there on the trail. They almost stepped on it. It is not happy with us being there. We stand still for a moment, than quickly skirt around it, and then let out our breath. Close one. Maybe that spooked us enough that it helped make the decision to take the road into CP6. Not the one we saw....but they blend in well! During the road trek, the rain continued and got heavier. I started thinking about the ride ahead of us. We rode the same hydro cut last year, and I remember the struggles I had. At the beginning of the race. On a dry day. In sunlight. Lot's of hills and lot's of rock. That would be super slippery in this rain. By this point Gerhard was having some old race injuries come back to haunt him, and he was fairly certain that we was not going to continue when we got to CP6/TA2. We jump on our bikes and start the ride which felt really, really good. And then the deluge began, the kind of rain that makes you pull over in your car because you can't see and your wipers won't work fast enough. But we made it, got back to HQ a bit before 5am. This time, unlike last year, we got to see many other teams come in, and hear bits of their stories. And yes, I think we'll be back next year. I just want to know one thing: how do the pro teams move so bloody fast while bushwhacking? This is what we got when we finished.....empty though. I was recently asked what motivates me. I emotionally stumbled through a rather predictable answer that involved my husband and sons. But I wasn't totally satisfied with my answer. And then I stewed about it for a day and a half. Because that's what I do. Now, don't get me wrong, my family DOES motivate me, but I'd like to think that I am not totally defined by them. I mean, I was someone before I was a wife and mother, right? And somewhere in there that person is still here, she's just, well evolved. So then, what else motivates me? Money? Nope (enough to get by seems to have been working for us) A smaller jean size? Sometimes. I came up with it last night. Happy people motivate me. Think about it, if you do something to make others happy, you are motivated to doing more things to make them happy. If you are doing something that makes you happy, well, you're motivated to keep doing it, or other things like it! And when you surround yourself with happy people....well, you get the picture. So, today I was motivated to do things that make me happy! I spent sometime with my youngest son this morning (ok...it was at the hospital because he is a typical 6 year old boy who falls and hurts himself, not to worry he is fine, under orders to not run or jump for two days....ummm, he's a 6 year old boy.) On our way back to school, we stopped at Starbucks for cookies and coffee (cookies=happy). I then visited with a friend, did some exercise, enjoyed some fresh air (a slow run on this snowy first day of spring) had a late afternoon cold beer with my husband. My sons helped me prep dinner, and then I cooked for my family. I love to cook, especially for others. And when it works, and everyone likes it, well that is just great! So tonight, we had what I have renamed Sunshine & Happiness in a Bowl (even though we ate off plates) in honour of the First day of Spring, and International Day of Happiness. 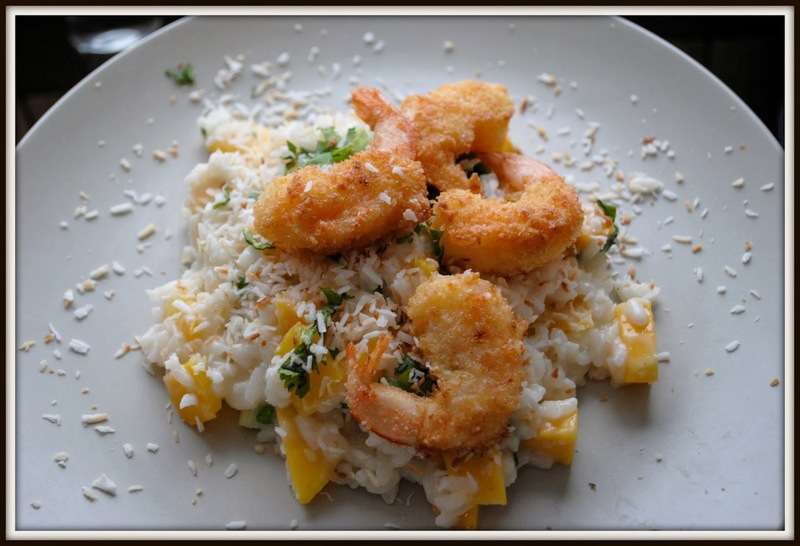 The Food & Drink magazine called it Coconut Shrimp Risotto with Lime & Mango. Either way, it is a "make it again Mom" dinner....enjoy, and I wish you happiness to you and yours!